For some time now I have been dreaming of a holiday in the north. I often visit the Canadian Rockies, which are north from Vancouver, but not the kind of north I am dreaming of. I want to see the wild north of Alaska and the Yukon. My kids were a bit too little to attempt a road trip up the coast this year, but soon, soon. So, with visions of the great white north dancing in my head, Dotty from the NetLoft, a lovely shop in Cordova, Alaska, asked if I would create a design for their Fiber and Friends Retreat . Of course I said yes! I was inspired by the photographs of their surroundings as well as The Cordova Gansey Project, a project of their creation. They are aiming to bring back the lovely woolly gansey’s for the modern day fisherfolk, fishing for Copper River Salmon near them. 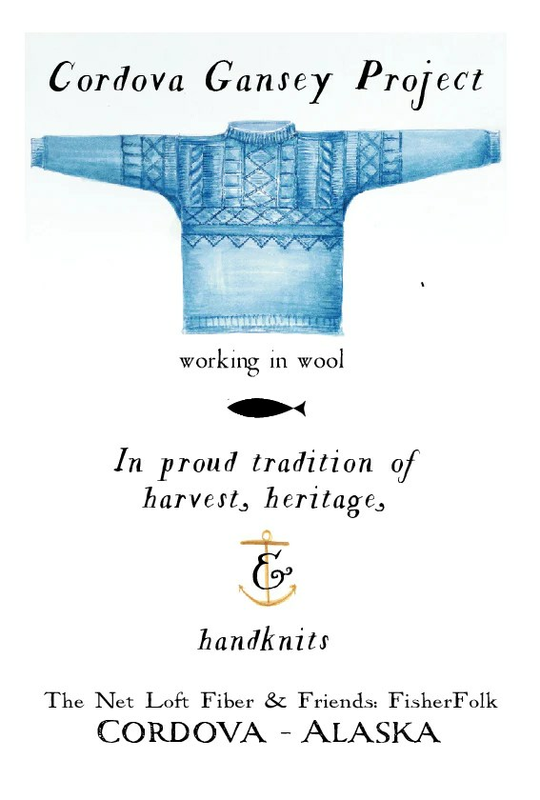 The design I came up with, Bowline, was inspired by vintage Gansey sweaters, knit up for fishermen to keep them warm at sea. 2 of Dotty’s children are modern fisherfolk, fishing for salmon off the coast of Alaska. Her daughter, Nelly, has a beautiful website for here and a great Instagram account: driftersfish, both full of inspiring photos of her life on the water. Bowline is a simple textured hat with a big brim, perfect for folding over and keeping out the icy Pacific winds. Sized for wee fisherfolk and big! It is a great hat to knit up in that single skein of woolly wool to create a hat to keep out the cold and last. I used the NetLoft’s Alaska Fisherman 12 Ply, a hearty worsted/aran weight yarn in lovely natural shades. The hope and desire of the “Cordova Gansey Project” is to educate and promote the making and wearing of hand knit wool gear and to reintroduce “fishermen sweaters” to the active and present commercial fishing industry, especially the next generation youth who are transitioning into leadership and ownership, as well as for those whose outdoor lifestyle would benefit from wool handmade garments custom knit for them by loved ones. The sentiment of knitting to keep your loved ones warm really resonates with me. I have always loved knitting gifts and one of my very first projects was a blanket, over 6 feet long to accommodate my tall Dad, who often found blankets too short for him. I love the feeling of putting a hand knit wool sweater on my wee ones to keep them warm when we spend time outdoors near the ocean. I feel there is a gansey design or 2 in Tin Can Knit’s future! Just catching up – this is wonderful! Kate Davies also has a pattern for the Cordova gansey project. This hat and her mitts would look gorgeous together. Lovely pattern – bought, downloaded, and raring to knit. I love ❤ this design! Now I know what I am going to knit for Christmas 🎄 hats! Thank you so much! This hat is adorable or handsome, depending on the wearer! I have been learning about ganseys and am designing one now, and have recently happened upon the Cordova Gansey Project thanks to a Kate Davies reference – so cool to see your pattern, these photos, and be introduced to driftersfish’s intstagram!